The Bell System was the system of companies, led by the Bell Telephone Company and subsequently by AT&T, which provided telephone services to much of the United States and Canada from 1877 to 1984, at various times as a monopoly. On December 31, 1983, the system was broken up into independent companies by a U.S. Justice Department mandate. 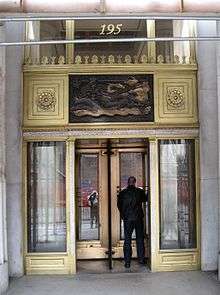 The colloquial term Ma Bell (as in "Mother Bell") was often used by the general public in the United States to refer to any aspect of this conglomerate, as it held a near complete monopoly over all telephone service in most areas of the country, and is still used by many to refer to any telephone company. Ma Bell is also used to refer to the various female voices behind recordings for the Bell System: Mary Moore, Jane Barbe, and Pat Fleet (the current voice of AT&T). In 1877, the American Bell Telephone Company, named after Alexander Graham Bell, opened the first telephone exchange in New Haven, Connecticut. Within a few years local exchange companies were established in every major city in the United States. Use of the Bell System name initially referred to those early telephone franchises and eventually comprised all telephone companies owned by American Telephone & Telegraph, referred to internally as associated companies, regional holding companies, or later Bell operating companies (BOCs). AT&T Long Lines, providing long lines to interconnect local exchanges and long distance calling services. Bell Labs, conducting research and development for AT&T. Bell operating companies, providing local exchange telephone services. In 1913, under AT&T ownership, the Bell System's growing monopoly over the phone system was challenged by the government in an anti-trust suit, leading to the Kingsbury Commitment, under which they escaped being broken up or nationalized in exchange for divesting themselves of Western Union and allowing non-competing independent telephone companies to interconnect with their long distance network. After 1934, AT&T was regulated by the Federal Communication Commission (FCC). Proliferation of the telephone allowed the company to become the largest corporation in the world until its dismantling by the United States Department of Justice in 1984, at which time the Bell System ceased to exist. Receiving a U.S. patent for the invention of the telephone on March 7, 1876, Alexander Graham Bell formed the Bell Telephone Company in 1877, which in 1885 became AT&T. When Bell's original patent expired 15 years later in 1894, the telephone market opened to competition and 6,000 new telephone carriers started while the Bell Telephone company took a significant financial downturn. On April 30, 1907, Theodore Newton Vail returned as President of AT&T. Vail believed in the superiority of one phone system and AT&T adopted the slogan "One Policy, One System, Universal Service." This would be the company's philosophy for the next 70 years. Under Vail, AT&T began buying up many of the smaller telephone companies including Western Union telegraph. Anxious to avoid action from government antitrust suits, AT&T entered into an agreement known as the Kingsbury Commitment with the federal government. Following a government antitrust suit in 1913, AT&T agreed to the Kingsbury Commitment in which AT&T would sell their $30 million in Western Union stock, allow competitors to interconnect with their system, and not acquire other independent companies without permission from the U.S. Interstate Commerce Commission (ICC). The Bell trademark pictured here was used from 1921 through 1939 by both the AT&T corporation and the regional operating corporations to co-brand themselves under a single Bell System trademark. The regional operating corporation's name was placed where "name of associated company" appears in this template version of the trademark. Bell system telephones and related equipment were made by Western Electric, a wholly owned subsidiary of AT&T Co. Member telephone companies paid a fixed fraction of their revenues as a license fee to Bell Labs. As a result of this vertical monopoly, by 1940 the Bell System effectively owned most telephone service in the United States, from local and long-distance service to the telephones themselves. This allowed Bell to prohibit their customers from connecting phones not made or sold by Bell to the system without paying fees. For example, if a customer desired a type of phone not leased by the local Bell monopoly, he or she had to purchase the phone at cost, give it to the phone company, then pay a 're-wiring' charge and a monthly lease fee in order to use it. In 1949, the United States Department of Justice alleged in an antitrust lawsuit that AT&T and the Bell System operating companies were using their near-monopoly in telecommunications to attempt to establish unfair advantage in related technologies. The outcome was a 1956 consent decree limiting AT&T to 85% of the United States' national telephone network and certain government contracts, and from continuing to hold interests in Canada and the Caribbean. The Bell System's Canadian operations included the Bell Canada regional operating company and the Northern Electric manufacturing subsidiary of the Bell System's Western Electric equipment manufacturer. Northern Electric was spun off in 1956 by Western Electric, but AT&T did not spin off Bell Canada until 1975. The Bell System's Caribbean regional operating companies were sold to the ITT Corporation, known at the time as International Telephone & Telegraph Co. The Bell System also owned various Caribbean regional operating companies, as well as 54% of NEC and a post-World War II reconstruction relationship with NTT before the 1956 boundaries were emplaced. Before 1956, the Bell System's reach was truly gargantuan. Even during the period from 1956 to 1984, the Bell System's dominant reach into all forms of communications was pervasive within the United States and influential in telecommunication standardization throughout the industrialized world. The 1984 Bell System divestiture brought an end to the affiliation branded as the Bell System. It resulted from another antitrust lawsuit filed by the U.S. Department of Justice in 1974, alleging illegal practices by the Bell System companies to stifle competition in the telecommunications industry. The suit was settled on January 8, 1982, superseding the former restrictions that AT&T and the DOJ had agreed upon in 1956. The Bell System service marks, including the circled-bell logo, especially as redesigned by Saul Bass in 1969, and the words Bell System in text, were used before January 1, 1984, when the AT&T divestiture of its regional operating companies took effect. Currently, the word mark Bell, the logo, and other related trademarks, are held by each of the remaining Bell companies, namely AT&T, Verizon, CenturyLink, and Cincinnati Bell. International rights to the marks, except for Canada, are held by a joint venture of these companies, Bell IP Holdings. Of the various resulting 1984 spinoffs, only BellSouth actively used and promoted the Bell name and logo during its entire history, from the 1984 break up to its merger with the new AT&T in 2006. Similarly, cessation of using either the Bell name or logo occurred for many of the other companies more than a decade after the 1984 break up as part of an acquisition-related rebranding. The others have only used the marks on rare occasions to maintain their trademark rights, even less now that they have adopted names conceived long after divestiture. 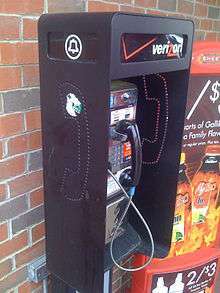 Examples include Verizon, which still uses the Bell logo on its trucks and payphones, and Qwest, formerly US West, which licenses the Northwestern Bell and Mountain Bell names to Unical Enterprises, who makes telephones under the Northwestern Bell name. Cincinnati Bell, a local franchise of the Bell System that was never wholly owned by AT&T and existed separately prior to 1984, also continues to use the Bell name. It stopped using the Bell logo in the summer of 2006, though it is still seen on some bills, vehicles, and other literature. In 1984, each regional Bell operating company was assigned a set list of names they were allowed to use in combination with the Bell marks. Again, aside from Cincinnati Bell, none of these Bell System names are currently in use in the United States. For example, Southwestern Bell used both the Bell name and the circled-bell trademark until SBC opted for all of its companies to do business under the "SBC" name in 2002. Bell Atlantic used the Bell name and circled-bell trademark until renaming itself Verizon in 2000. Pacific Bell continued operating in California under that name (or the shortened "PacBell" nickname) until it was bought out by SBC. Of the various resulting 1984 spinoffs, only Bell Canada continues to use the Bell name, although cessation of using either the Bell name and circled-bell trademark occurred for some of these companies multiple decades later. For example, for the multiple decades that Nortel was named Northern Telecom, their research and development arm was Bell Northern Research. Bell Canada and its holding-company parent, Bell Canada Enterprises, still use the Bell name and used variations of the circled-bell logo until 1977, which until 1976 strongly resembled the 1921 to 1939 Bell System trademark shown above. Before the 1956 break-up, the Bell System included the companies listed below, plus those listed in the pre-1984 section. Northern Electric, and the Caribbean regional operating companies were considered part of the Bell System proper before the 1956 break-up. Nippon Electric was considered a more distant affiliate of Western Electric than Northern Electric, where Nippon Electric via its own research and development adapted the designs of Western Electric's North American telecommunications equipment for use in Japan, which to this day gives much of Japan's telephone equipment and network a closer resemblance to North American ANSI and Telcordia standards than to European-originated ITU-T standards. Before the 1956 break-up, Northern Electric was predominantly focused only on manufacturing without any significant amount of separate telecommunication-equipment research & development of its own. The post-World War II-occupation operation of NTT was considered an administrative adjunct to the North American Bell System. After 1984, there were multiple mergers of the operating companies themselves, as well as multiple Baby Bells that came together, and some components are now in the hands of companies independent from the historic Bell System. The structure of the companies today is as follows. The following companies were spun off after 1984 from AT&T Corp. or the Baby Bells and do not provide telephone service. Alcatel-Lucent Bell, a present-day subsidiary of Alcatel-Lucent that was founded in Antwerp, Belgium in 1882, by Western Electric. It came into Alcatel-Lucent ownership via ITT and Alcatel. Beginning in 1991, the Baby Bells began to consolidate operations or legally rename their Bell Operating Companies according to the parent company name, such as "Bell Atlantic – Delaware, Inc." or "U S WEST Communications, Inc.", to "unify" the corporate image. To this day, the only remaining Baby Bell that has not renamed its operating companies is AT&T, formerly SBC Communications. Since 2001, there have only been 17 of the original 22 Bell Operating Companies, following the mergers of U S WEST's and BellSouth's operating companies and reincorporation of Southwestern Bell. Only 9 of those 19 have retained their original corporate name since their incorporation before 1984. ↑ AT&T Corporation. "AT&T History: The Bell System". Archived from the original on September 6, 2008. Retrieved 2008-12-22. 1 2 3 4 5 6 7 "Unnatural Monopoly: Critical Moments". Cato Institute. Archived from the original on 10 September 2008. Retrieved 2008-09-17. ↑ "Bell's Telephone". Franklin Institute. Archived from the original on 12 September 2008. Retrieved 2008-09-17. 1 2 3 4 5 6 "AT&T Milestones in AT&T History". AT&T. Archived from the original on 28 September 2008. Retrieved 2008-09-17. 1 2 "AT&T History: The Bell System". AT&T. Archived from the original on 3 October 2008. Retrieved 2008-09-17. ↑ Brooks, John. Telephone: The First Hundred Years, Harper & Row, 1976, ISBN 978-0-06-010540-2. ↑ USPTO record for trademark serial no. 73727728 (example "Bell" registration originally held by Pacific Telesis): "Registration is nationwide, but is subject to the condition that registrant shall use the mark only in conjunction with one or more of the following modifiers; "Nevada Bell", "Pacific Bell", "Pacific Telephone", "Pacific Telesis", or "PacTel". Use of a modifier shall be considered to be in conjunction with the mark if it is used in sufficient proximity to the mark such that a reasonable observer would normally view the mark and the modifier in a single visual impression and would recognize that both the mark and the modifier are used by registrant. Registrant's right to exclusive use of the mark is subject to the rights of the [other RBOCs], to which concurrent registrations in the mark have also been issued, to use the mark in conjunction with one or more of the modifiers specified in those registrations[...]"